Thompson explains that a growing number of historic sound recordings are becoming more easily available online, providing an ever-greater opportunity to listen in on the past. 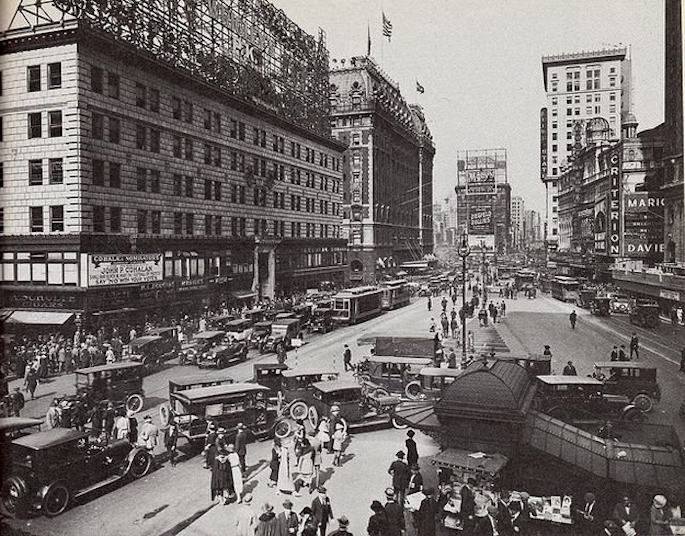 Unique sound excerpts from Fox Movietone newsreel footage from 1926 through 1930 offer what Thompson calls “a sonic time machine.” There are fog horns, shouting peddlers, rumbling elevated trains, pounding riveters, and laughing children. Much of this footage never made it into the the published newsreels. 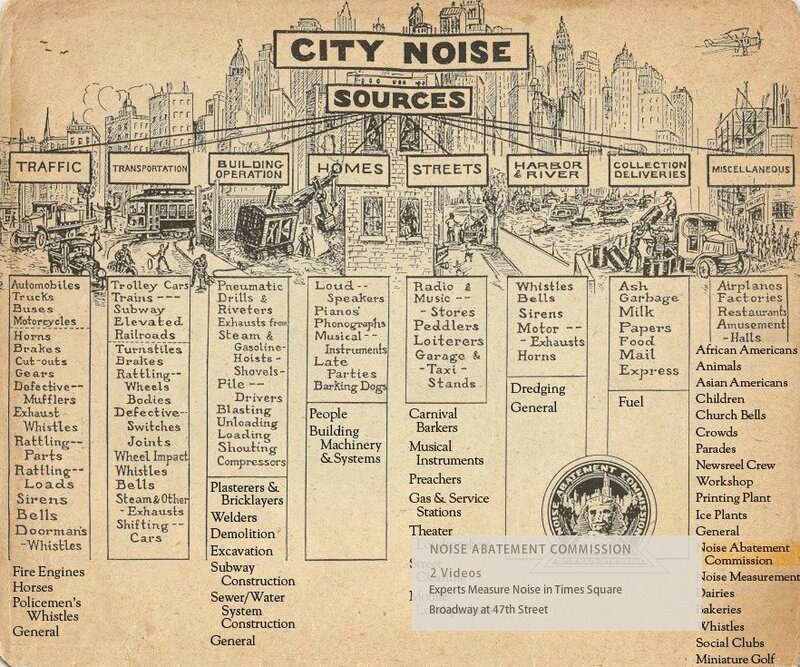 Using archival materials like newspaper articles, sound complaints, and newsreel footage, visitors can scroll through a list of sounds of street traffic or read (undoubtedly familiar) complaints of noisy parties and barking dogs. The goal is to “enable each visitor to chart their own unique journey through this material and thereby transport themselves back in time, constructing a historically-oriented mindset through which to perceive the images and sounds.” Vistiors can choose between journeys built around Sound, Space, and Time. 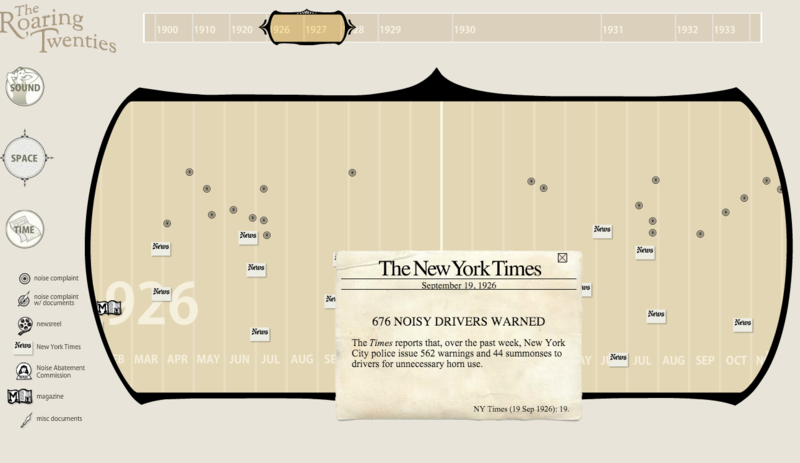 Thompson makes the point that the city may not have, in fact, become noisier, and that most of the physical sounds about which we complain today (hello, horn-honkers) have been around at least since the 1920s (though we have perfected techniques of better blocking out the sound with earphones and the like). “By understanding how a past generation struggled against a physical adversary yet still thrived within the challenges posed by their environment, we may be emboldened to find a way to master the noise in our own lives,” she says.